The TRAFFIC DOOR by The Australian Trellis Door Co. is a custom-made, high impact heavy-duty door. Traffic doors provide a barrier between two areas. They are designed to be opened by impact. They can close automatically from either direction. They open from either direction as they are impacted by trolleys, pallet jacks, forklifts etc. 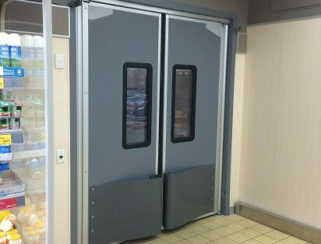 They can span 3000mm high by 2500mm wide, and can be made as either single or double doors.